Although spectacles were originally used for correcting vision they have now become fashionable wear. They have become a great accessory driving people to pay attention to how they want to be perceived with the type of frames they are wearing. At London Eye Optique Barbican we understand the importance of having a pair of spectacles that are suitable to your all of your requirements. 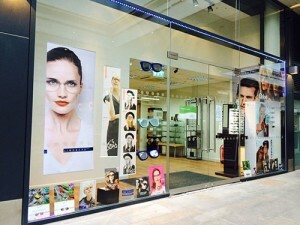 Our team of qualified dispensing opticians here at London Eye Optique (EC1Y) will always aim to give you the best advice suitable. With their detailed approach in hand they will consider your prescription along with your facial characteristics and lifestyle requirements and talk you through the options that are right for you. Correcting your vision doesn’t just stop at spectacles did you know that we offer advice on prescription Sunglasses and prescription Sports Eyewear too? We work with a wide range of lens suppliers including Nikon, Essilor, Hoya, Seiko and other specialist lens companies. This means that unlike the big chains we are not obliged to use one supplier but concentrate on obtaining the correct lens options that are best suited to your needs. When choosing eyewear they will help you find the right frame that suits your facial features, fashion sense, budget and prescription.